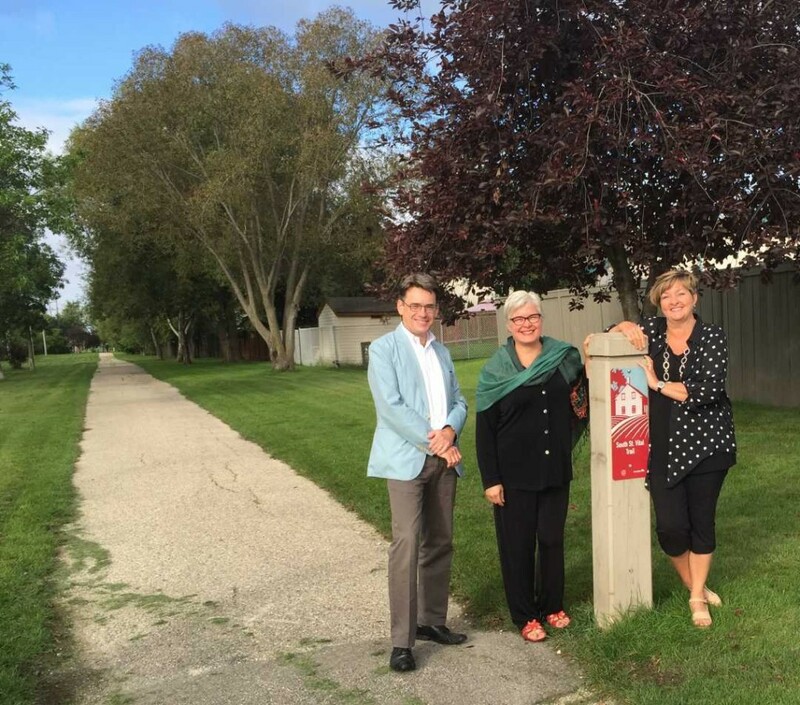 I was very pleased to work with Councillor Brian Mayes (St. Vital Ward) and my colleagues from the Province of Manitoba, MLAs Theresa Oswald and Christine Melnick, to enable the recent installation of a crosswalk on Dakota Street, linking the two wards of St. Vital and South Winnipeg-St. Norbert via the very popular South St. Vital active transportation trail. This new, lighted pedestrian corridor enables safe access to École St. Germain, École George McDowell, Samuel Burland School and Highbury School, as well as associated parks and playgrounds in the neighbourhood. More details of this project are outlined below, in an article prepared by Councillor Brian Mayes. One of the more controversial, but also rewarding, aspects of the councillor’s job is establishing new, lighted pedestrian crosswalks. 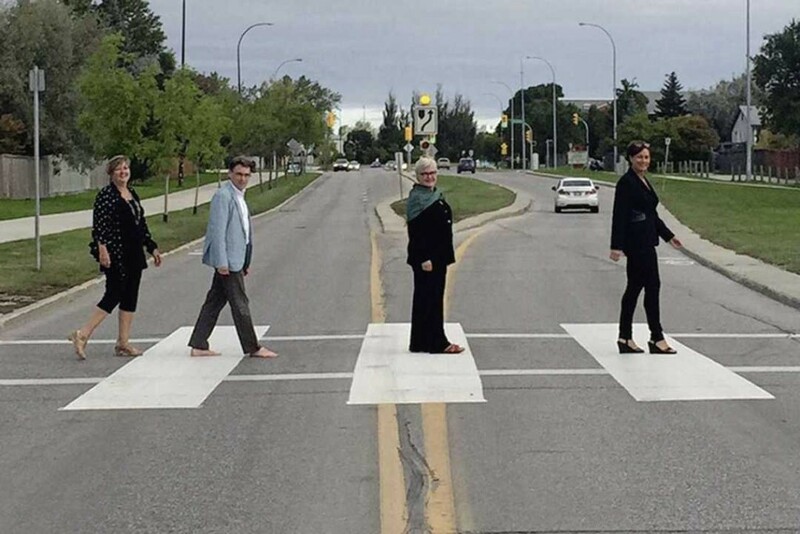 In recent weeks two new crosswalks have been established in St. Vital which will enhance the safety of students (on foot or on bike) and adult pedestrians. Both projects involved innovative solutions to ongoing issues. The first crosswalk crosses Dakota Street at the intersection with the South St. Vital Trail, just north of Warde Avenue. Many residents approached me about establishing a lighted crosswalk at this crossing after the Louis Riel School Division (LRSD) changed the catchment areas of some south St. Vital schools in 2014. The South St. Vital Trail borders on three schools, and with the catchment changes more students are using the trail to bike or walk to school, involving a crossing of Dakota. Rather than wait for potential future city funding, the city and provincial representatives for the area (MLAs Theresa Oswald and Chris Melnick along with myself and South Winnipeg councillor Janice Lukes) came together, with the support of LRSD staff and trustees, to find a solution. After another project came in under budget we were able to reallocate money from the Building Communities Initiative, a joint city-provincial initiative. Four adults and a crosswalk photo needed — a certain Beatles fan in my household suggested that we pay tribute to the Abbey Road album cover. Judge for yourself from the photo whether we pulled it off. The second crosswalk is a much requested lighted crossing at Carriere and St. Mary’s Road, at the extreme north end of my ward. After the unlighted crosswalk at Guay and St. Mary’s was removed, the need for a new lighted corridor became a priority, and I authorized use of some of my ward’s discretionary funds to construct the project. The actual crosswalk lies about three feet into St. Boniface ward, but I did not want the project to be delayed on this technicality, and it will certainly benefit many St. Vital ward residents. I have already received positive feedback about the new crossing at Carriere, including the wonderful line from one resident “sweet sassy molassey, the cars actually stop”. Many residents request lighted crosswalks, and it just not possible to fund them all. However, by working with other levels of government and my city council colleagues I am pleased we have been able to make these two projects a reality.